The real measure of a telescope’s power is not how greatly it can magnify a distant object, but what portion of that object’s light the instrument actually collects. It’s easy if you think of the photons, or light particles, as raindrops, and the telescope as a bucket. The larger your bucket is, the more rain you will collect. Similarly, a telescope’s “light gathering power” is a measure of how efficiently it collects photons, and this power depends on the diameter or “aperture” of the lens, or mirror. For over a century, astronomers have raced to build telescopes with larger and larger apertures precisely so that they could gather more of the heavens’ light. In essence, a large lens or mirror allows scientists to look deeper into space and see fainter objects. 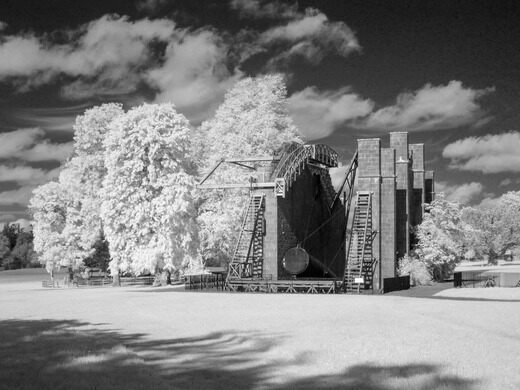 An early example of this thirst for photons is the Leviathan of Parsonstown, a six-foot-diameter telescope built in the 1840s by William Parsons, the third Earl of Rosse. 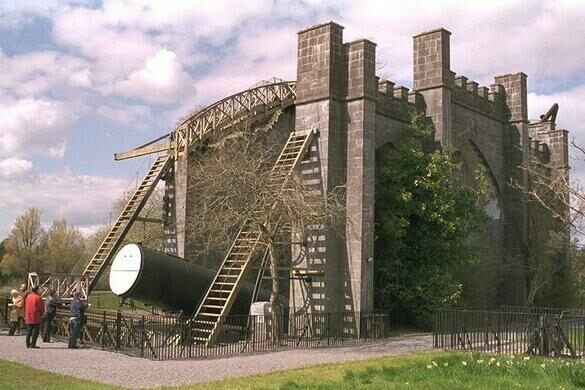 For many years, Lord Rosse studied the night sky using his 36-inch telescope at Birr Castle in Ireland. The objects which interested him most were called “nebulae,” a term that once referred to any fuzzy object in the sky. At that time, it was not known that these so-called nebulae were actually an assortment of different objects ranging from star clusters and galaxies to clouds of gas and dust. The telescopes of Parsons’s day were simply not powerful enough to resolve the mysterious wisps of light. Consequently, an outstanding question in astronomy arose: “Do nebulae contain stars?” Knowing that a larger instrument was needed to resolve this issue, Lord Rosse set out to build a six-foot telescope. All that stood in his way were a number of remarkable feats of engineering that would have to be performed to build such a device. Today it is possible to create telescope mirrors in excess of 30 feet by coating a glass surface with a reflective metal. In the late 1800s, however, mirrors were made using the much heavier and more problematic speculum metal. This copper and tin alloy is not only difficult to cast and shape, but also quick to tarnish in humid climates such as Ireland’s. However, after three attempts using large peat-fired furnaces, Lord Rosse and his men succeeded in creating the world’s largest telescope mirror. In actuality, two mirrors were made: a backup was necessary because the speculum’s sensitive nature required the mirror to be resurfaced every six months. 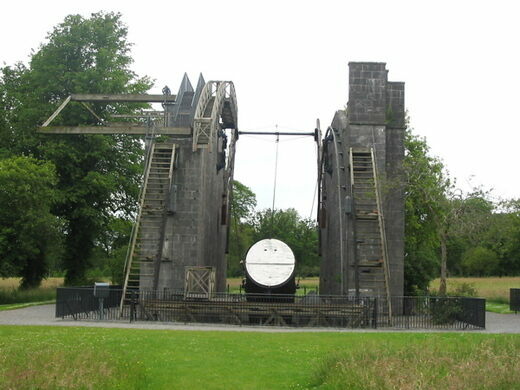 Dubbed the Leviathan of Parsonstown, Lord Rosse’s reflecting telescope remained the largest in the world for over 75 years. However, the instrument was not without its drawbacks. 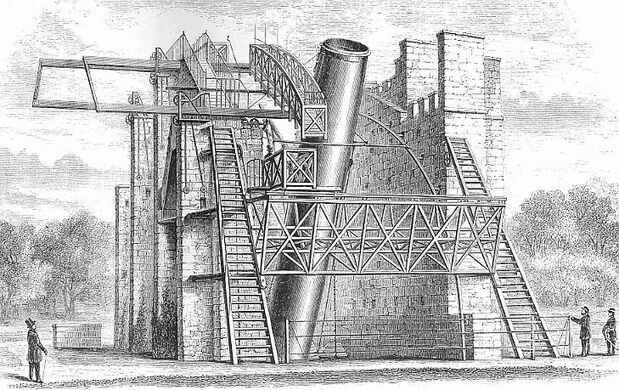 To accommodate such a large telescope, a unique mounting system was employed which restricted motion in the east-west direction. This mount was the first and last of its kind, and, with a fortress-like appearance, it remains quite impressive. The 58-foot telescope tube is suspended between two stone walls, 70-feet-long and 50-feet-high. At the top of these walls, which protect the instrument from high winds, is a movable observing platform. From here Lord Rosse spent many cold nights drawing the elaborate celestial structures revealed to him. At first, the majority of observations taken were of the Moon and several of the planets. While the instrument exposed our solar system in greater detail than ever, the most important discovery made at Parsonstown was that of the spiral nature of the M51 nebula. Now known as the Whirlpool Galaxy, M51 was the first categorized spiral object. 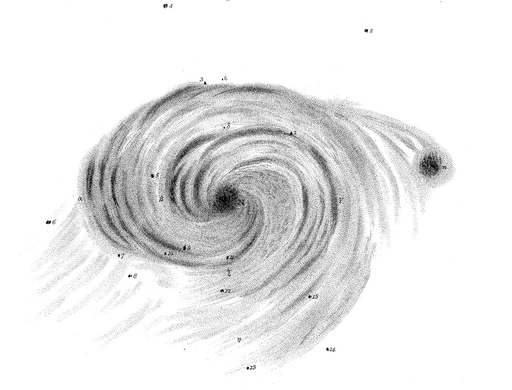 While Lord Rosse correctly observed M51 to be “studded with stars,” the debate over the true characteristics of nebulae lingered, and it was not until the 1920s that Edwin Hubble recognized some of the fuzzy objects to be galaxies like our Milky Way. Nevertheless, the Leviathan is a testament to Parsons’ skills in engineering, optics, and astronomy. In fact, for one galaxy, the Earl’s hand-drawn illustrations contain more detail than a photograph taken with the 200-inch telescope at Palomar Observatory a century later. Continuing in his father’s footsteps, the fourth Earl of Rosse, used the telescope for his own observations. 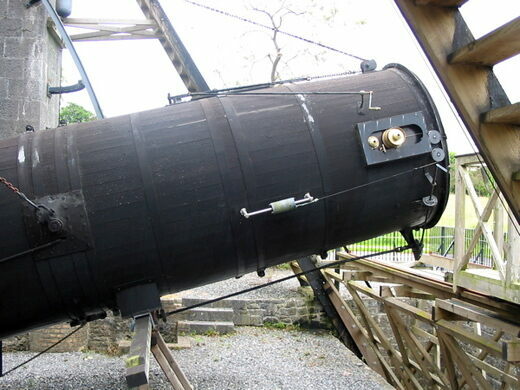 The instrument fell into disuse in 1878, however, and was dismantled in 1908. Thanks to the seventh and present Earl, the telescope was reconstructed in the late 1990s with a new mirror and motors to make pointing easier. Observations continue even today, as amateur astronomers often peer through the Leviathan. 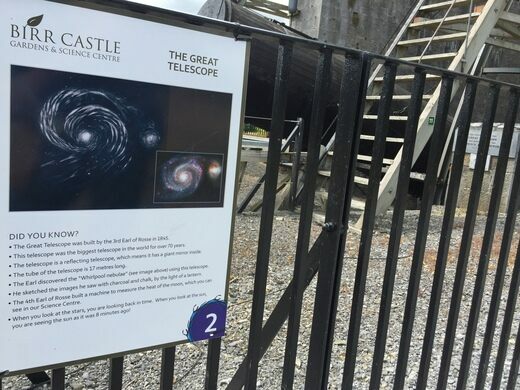 Ireland’s Historic Science Centre also resides at the castle, where a large collection of astronomical instruments and artifacts are on display. But to catch a glimpse of the original speculum mirror, you must travel to the London Science Museum. 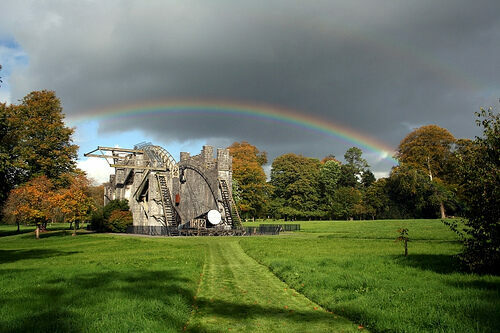 Birr Castle Demesne is located in County Offaly, in the center of Ireland. 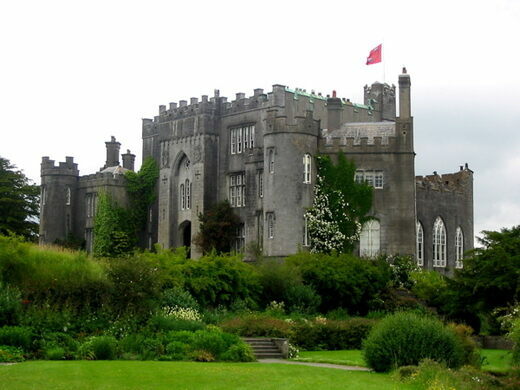 Birr can be reached by car in 2 hours from Dublin and in about 1 hour from Shannon Airport and Galway city.